Rainbow Fluorite is a semi-precious gemstone which can be utilized in attractive, unique jewelry designs. Rainbow fluorite, with its varying colors from blue to green to purple, is unlike any other crystalline stone; no two pieces of jewelry made with it are ever exactly the same! 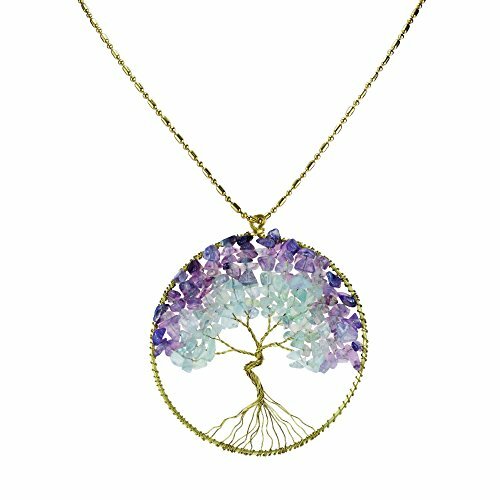 If you are a lover of crystalline jewelry, or believe in the healing and meditative powers of crystals, then surely you will want to add some Rainbow Fluorite jewelry to your collection. This page features a selection of Rainbow Fluorite jewelry including bracelets, necklaces, rings, earrings and pendants currently available for sale. Shop for great prices from a variety of sellers to find just the piece of jewelry you're looking for, whether for yourself or for the perfect gift for someone else. 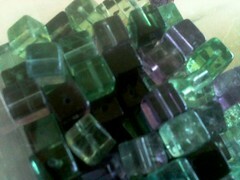 You can also learn more about the properties of rainbow fluorite and shop for beads to make your own jewelry as well. Its Properties and Composition Necklace made with rainbow fluorite, amethyst, glass, and sterling silver. Fluorite is halide mineral, composed of calcium fluoride (CaF2). It comes in a wide variety of colors - perhaps the widest variety of any mineral - hence the name "Rainbow fluorite" when used in jewelry showcasing a range of its color spectrum. Rainbow fluorite can be found in a variety of colors and hues, from aqua-green to light yellow-green to deep purple - and everything in between! Gold, red, yellow, blue, grey...all of these varieties are possible, although green-to-purple is the most common found in jewelry applications. In jewelry designs, rainbow fluorite works very well with other stones like amethyst, turquoise, onyx, moss agate, hematite and also freshwater pearls. Rainbow fluorite can be delicate and soft, however, and should be treated with care so that stones and beads do not chip and fracture. When looking for fluorite for jewelry, look for beads and cabs that have strong, rich colors and aren't too "washed out" or with dull edges. Often you may need to purchase several strands or bags of beads at once in order to get enough of the colors that you want to work with - but that can be a lot of the fun! Rainbow fluorite is a powerful healing and meditative crystal, often used in massage therapy as it is good for the cellular and nervous systems. 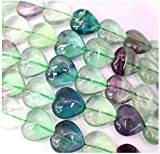 It's specific healing properties can depend on the color: green fluorite is good for cleansing, whereas clear fluorite is best for obtaining balance. These heart beads are great for jewelry-making designs! Turn a closely-matched pair into earrings, hang them on simple chains, or work them into beaded designs of many kinds. Especially great for Valentine's Day designs. Fluorite: Is It Real or Fake? Crafters may make "faux fluorite" using polymer clay, but the difference in appearance is quite obvious to anyone who has studied true fluorite first. What is more common and problematic is the use of photo-enhancement techniques to make the color of fluorite beads and cabs look more intense than they really are. So be sure to examine photos of fluorite jewelry closely and carefully, if you cannot purchase pieces in person so you can study them first with your own eyes. Hand-crafted jewelry for sale on Etsy, the global craft marketplace. Unique rainbow fluorite jewelry, direct from the manufacturer. 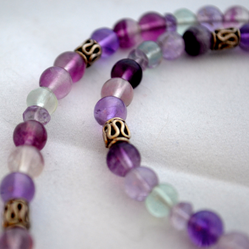 Stunning pieces of fluorite jewelry in a variety of colors and styles. Well worth checking out their selection. 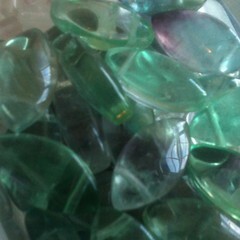 Fluorite "leaves" is a brilliantly one of a kind and lovely semi-precious stone in beautiful.